The Northshore Humane Society's mission is "To be the premier organization dedicated to enhancing and saving the lives of pets in the Northshore region through community engagements, adoption, spay and neuter programs, and sheltering." The Northshore Humane Society has been serving abandoned and neglected animals in the Northshore area since opening their doors in 1953. Since then, they have become one of the largest nonprofit organizations in Louisiana. 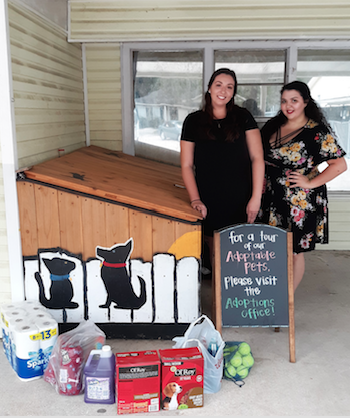 They host multiple adoption events year round, they offer lost cost spay and neutering, and many other services such as veterinary care and fostering. To learn more about the Northshore Humane Society and all that they do, click here! In order for the Northshore Humane Society to achieve their goals and carry out their mission, they need help from the community. They offer multiple volunteer opportunities to anyone interested in helping out any way that they can. If you are interested in volunteering with them, visit here! They also accept monetary donations and in-kind donations. They keep an up to date donation wish list on their website of all the items they are in need of. If you would like to make a donation of your own, click here to see how you can make a difference! RexNOLA understands the importance of finding perfect homes for families in St. Tammany, so we are proud to support the Northshore Humane Society's mission of providing loving homes and healthy lives for our community's animals. It was our pleasure to bring over many useful items that the shelter can use, such as cleaning supplies, blankets, dog treats, and cat toys. Woofstock is a large event hosted by the Northshore Humane Society every year. Woofstock includes a low cost veterinary clinic for dogs (no cats), festival, and a huge adoption event all rolled into one major event! This year it will be held on March 24th from 8:30am-3:00pm at the Castine Center in Pelican Park, 63350 Pelican Blvd. Mandeville, LA 70448. If your are interested in sponsoring or donating items for the raffle, please email kseiler@nshumane.org.